The first text to document Asian women’s resistance to gendered racism in Britain. 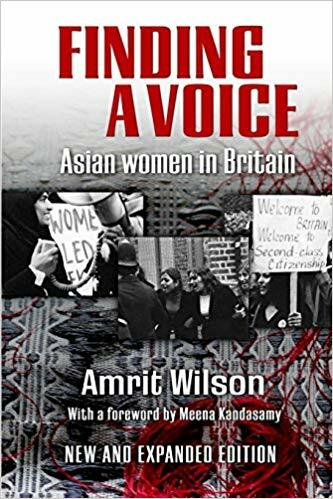 Amrit Wilson wrote Finding a Voice: struggles of South Asian women in response to institutional racism and a heightened awareness of gender inequality. First published in 1978, and winning the Martin Luther King Memorial Prize for that year, Finding a Voice established a new discourse on South Asian women’s lives and struggles in Britain. Through discussions, interviews and intimate one-to-one conversations with South Asian women, in Urdu, Hindi, Bengali and English, it explored family relationships, the violence of immigration policies, deeply colonial mental health services, militancy at work – and friendship and love. The seventies was a time of some iconic anti-racist and working-class struggles. They are presented here from the point of view of the women who participated in and led them. In 1979, Awaz – the first feminist Asian women’s collective in the UK – co-organised a massive national demonstration against police brutality, in collaboration with Brixton Black Women’s Group and the Indian Workers’ Association GB. Also in 1979, and alongside the Organisation of Women of African and Asian Descent (OWAAD) Awaz organised a powerful picket at Heathrow airport, protesting the horrific “virginity tests”, which some migrant women were subjected to by immigration services on their arrival to the UK. 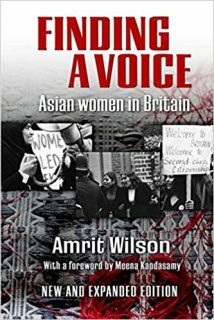 Amrit Wilson is a writer and activist on issues of race and gender in Britain and South Asian politics. She is also a founder member of South Asia Solidarity Group and the Freedom Without Fear Platform, and a board member of Imkaan, a Black, South Asian and minority ethnic women’s organisation dedicated to combating violence against women in Britain. Other books by her include: Dreams Questions Struggles—South Asian women in Britain, published by Pluto Press in 2006, and The Challenge Road: Women and the Eritrean revolution, published by Africa World Press in 1991. Finding a Voice, which has just been re-published, was the first text to document Asian women’s resistance to gendered racism. The new edition includes a preface by Meena Kandasamy, some historic photographs and a remarkable new chapter titled ‘In conversation with Finding a Voice: 40 years on’ in which younger South Asian women write about their own lives and struggles, weaving them around those portrayed in the book.